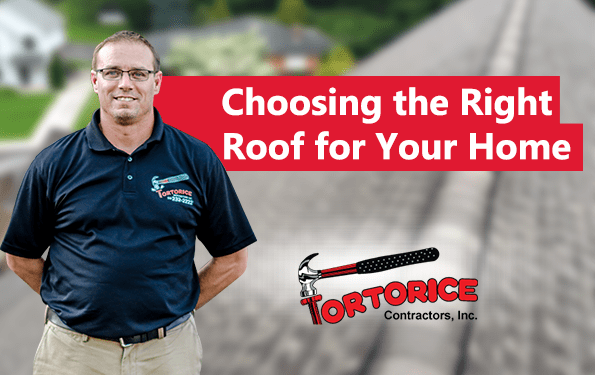 Haddon Township Roofing Contractor: Choosing a Roof for Your Home - Tortorice Contractors Inc.
Building a new home can be exciting. You can design it any way you want, paint it with your favorite colors, and fill it up with furniture you love. One of the most important parts of a house though is the roof. It protects your family from weather elements and keeps you safe at night. This is why choosing a good roofing material is important. Your Haddon Township roofing contractor might have a few suggestions. Here are some of the most popular choices for roofing materials. Over 75% of American houses use asphalt shingles as roofing materials. Many Haddon Township roofers like this material because it is cheap and easy to install. This type of material is also very durable, has the ability to withstand different types of weather, and works well in all seasons. They can also be used with different architectural styles. Most asphalt shingles can last up to 30 years before they need to be replaced. However, asphalt shingles also have disadvantages. The first thing to consider is that they don’t have good insulation. Asphalt shingles are also made from petroleum products which means that they are not recyclable due to the fiberglass added to help achieve different colors. According to roofing firms from Haddon Township, wooden shingles and shakes come in cedar, redwood, cedar pine, and many other types of wood. Wood shingles are machine-cut while wood shakes are hand-cut and have a more uneven look. Before buying a wood shingle or shake, check your local fire code to see if you’re allowed to use this roofing material. According to Haddon Township roofing companies, these types of materials only have a Class C rating while some of them have none. This type of roofing material is made from natural materials. However, they are also prone to rotting, splitting, and mold. However, wood shingles and shakes are also lightweight, durable, and UV resistant. Clay and concrete tiles might be heavy but they are also fire resistant. There are roofers from Haddon Township that like to recommend these materials because they come in light colors and adhere to cool roofing standards since they reflect 50% of the sun’s solar energy. Concrete tiles are elegant and can add to your home’s value while providing greater protection for its residents. They are very versatile and come in many different shapes, textures, and colors. Try to find a manufacturer that uses local sources for their clay tiles. This will make them a green roofing option. Concrete tiles are energy efficient and can be made from sustainable materials. Slate is a very beautiful material with a distinctive appearance. However, it is also very heavy and a bit expensive which is probably why it is not often recommended by many roofing contractors in the Haddon Township. Slate is a dark color so it is not recommended for use in high heat areas. It is very durable which means it can last for many years. This types is also easy to repair and is recyclable. If you’re looking for a roof that has temperature control, a good choice is metal roofs, according to most Haddon Township roofing companies. Metal roofs can be made of copper, aluminum, and stainless steel. In most cases, they contain a high percentage of recycled materials. It offers high insulation, good solar reflectance, and durability. It can also sometimes last longer than asphalt shingles. Aside from durability, metal roofs are also lighter compared to other roofing materials and do well in any kind of weather. Metal roofs are moderately expensive and the price differs on the type of metal used. This material is a composite composed of clay, concrete, and wood fibers. This mixture is not only durable but also fireproof. Most of the time fiber cement tiles are shaped to look like wood shakes, so they are often easily mistaken for each other. According to a roofing company in the Haddon Township, fiber cement roofing is not as heavy as regular concrete so it does not need much reinforcement. It is very durable and available in many different colors and textures. They are ideal to use in warm climates but tend to crack in cold weather, especially when they are stepped on. When it comes to choosing a roof the type of material, style, coloring, and cost matters because it all impacts the way your house looks. It can also affect other housing building expenses like drywall, appliances, and flooring. A reputable roofing contractor in the Haddon Township can help you pick the right roofing materials that will compliment your house and won’t exceed your budget.